Several years ago, I spotted Horizons Math homeschool curriculum at a local fair and immediately fell in love with it for many reasons. 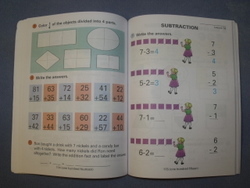 I knew that it would appeal to our children because of its colorful and engaging layout of the pages. I was also very impressed with the solid course of study that was presented, even in the early grades. A child would easily be prepared for the tougher math subjects in the higher grades after completing their foundational work with Horizons. Some of the benefits of this program include a strong Christian viewpoint as you instruct your child, colorful resources with fun activities to keep your child engaged, and suggested manipulative practice to liven up the lessons. Our children have always really enjoyed using this program. It was very easy to get them to complete their workbook pages and they found the work challenging but never overwhelming. I used the supplemental worksheet pages as drills for their math facts but didn't find the teacher's guide to be necessary. Primarily, its size was cumbersome and I never really needed it. However, I could see it being useful as an answer key for the third through sixth grade math problems. Without a doubt, Horizons Math is one of the best homeschool curriculum choices available for kindergarten through sixth grades. Take a look for yourself and see whether you agree that your child might enjoy this program too!